The pronunciation of a certain word or sound unit may be different between various languages. For example, in the Japanese word “genba”, the first syllable is pronounced with a hard “g” sound as in “get”, not a soft “g” sound as in “gem”. So, how can you manipulate your Text-to-Speech (TTS) engine to reflect such differences? Genba is a Japanese term meaning “the actual place”. <phoneme alphabet="x-sampa" ph="gInbA">Genba</phoneme> is a Japanese term meaning "the actual place". As you can see, by inserting a simple tag, the word “genba” is now pronounced correctly. SSML has many other capabilities when working with TTS. It can add pauses between sentences and/or paragraphs, emphasize certain words, select a speaking voice by attributes, as well as set the pitch, rate, and volume of the speaking voice. Read more about SSML and its features at either the Microsoft or Amazon Speech Platforms. When working on your project in VideoLocalize, you can use SSML formatted text to control various aspects of synthetic speech production very easily. 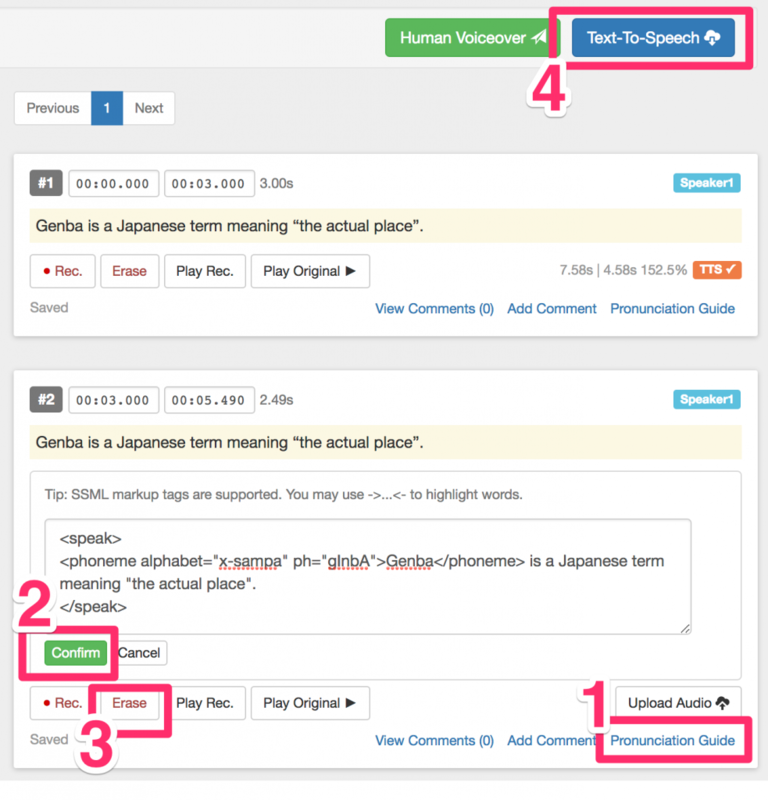 Step 1: Click on the “Pronunciation Guide” of the segment you want formatted. Once you click on it, a text box will appear beneath the translated Chinese text. Step 2: Type in your SSML tag, and then click the “Confirm” button. Step 3: If there was a previous recording of that segment, you should “erase” it first. If there is no previous recording, then just skip Step 3. Step 4: Generate a new recording by clicking on the “Text-to-Speech” button.